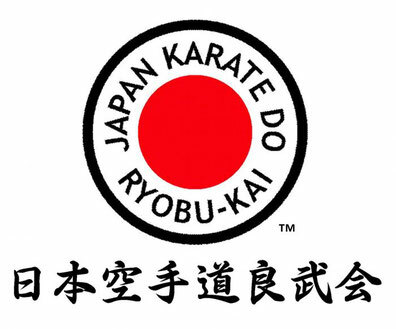 Shindo Jinen-Ryu Karate - Site de goshinkaratedo ! Peu connu en France, le Shindo Jinen-Ryu est pourtant un style classique, reconnu la fois par la Butokukaï et la WKF. Au sein de la Japan Karate-do Ryobu-Kaï il s'est notamment développé sous une forme sportive, bien loin de l'art martial authentique - au sens anthropologique du terme -, alors qu'il contient nombre de références puisant à plusieurs sources anciennes. Son fondateur, Yasuhiro Konishi, médecin de formation, a eu le souci de prêter une attention particulière aux... aspects physiologiques (respect de l'anatomie et des possibilités physiques de chacun) et psychiques ("shin" signifiant "esprit", Y. Konishi insista sur le travail à la fois de maturation psychologique et symbolique). Formé à plusieurs écoles de Ju-jutsu anciennes, à l'art du sabre, il intégra le karate-jutsu des années 30 lorsqu'il devint ami avec G. Funakoshi entre autres. Par ailleurs proche de M. Ueshiba il fit donc évoluer l'école Shindo Jinen, loin des développements athlético-sportifs, en établissant une forme de synthèse (approche philosophique) entre des arts et influences divers, faisant de son école de Karate-do une voie martiale propre à servir l'épanouissement de l'humain. Si on se réfère aux critères uniquement sportifs, certes tout à fait bénéfiques sur le plan d'une première étape de croissance, le Karaté peut suffire à satisfaire la réalisation de soi. Au-delà, puisant dans ce qui caractérise les aspects symboliques de l'art martial et de sa transmission, c'est par la lecture du Kata (interprétation de la forme) que l'initié parvient à vaincre son ego, s'appuyant aussi sur la transmission à l'autre. L'école a intégré des Kata des courants Shuri, Naha et Tomari-te ; en plus simple, on pratique des formes usitées aussi bien en Shotokan-Ryu et en Shito-Ryu. Pourtant, à bien regarder, au-delà d'une esthétique proche, des subtilités sont présentes qui font se distinguer les styles. On citera un Kata spéficique de l'école Shino Jinen : Seiryu. Kara court, simple d'aspect dont la lecture en niveaux (compétence) d'interprétation permet une étude poussée. Le bunkaï (bunkaïru : décortiquer, déconstruire) évolue vers Oyo et Henka, étape aux variantes infinies retournant pourtant toujours à la forme d'origine. Pour ce qu'il en est des "styles" ou "écoles" (traditionnels) de Karaté, selon des historiens, en associant les iles hawaïennes, on peut dénombrer entre 700 à 800 styles, allant de quelques dizaines à plusieurs millions de pratiquants. La Japan Karate-Do Ryobu-Kaï est, d'une certaine manière, la vitrine "normée" du Shindo Jinen-Ryu. Elle a, comme les autres styles majeurs, ses propres championnats et plusieurs variantes d'arbitrage notamment sur les Kata libres. Pour peu que l'on se fasse chercheur, dans une sorte de démarche anthropologique, s'ouvre alors plusieurs portes sur d'autres champs, connexes mais cachés, ou voilés. Le dévoilement advient lorsque l'initié chercheur poursuit sa quête au-delà des apparences, à la manière d'un Champollion décodant le hiéroglyphe. Séminaire International organisé à Paris en juin 2001 à l'occasion de la venue exceptionnelle de Soke Konishi, 10ème Dan. Frédéric Masseix avec les Maitres Konishi et Yamazaki. 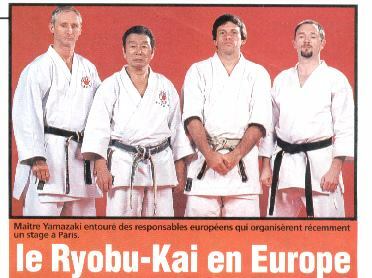 Sensei K. Yamazaki, actuellement 8ème Dan est devenu le Soke de la Japan Karate-Do Ryobu-Kaï suite au décès de Soke Konishi. Shindo Jinen Ryu was founded by Yasuhiro Konishi, who was born in 1893 in Takamatsu, Kagawa, Japan. 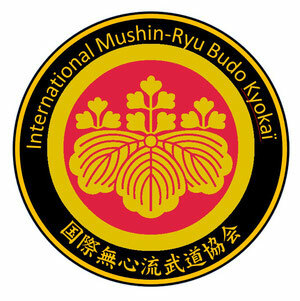 Konishi Sensei began his martial arts training at age 6 in Muso Ryu Jujitsu. When he entered the equivalent of a western high school, he began training in Takenouchi Ryu jujitsu. This particular jujitsu style is known for its strong kicks and punches, very similar to karate. At age 13, while practicing jujitsu, Konishi Sensei began studying kendo as well. In 1915, he commenced studies at Keio University in Tokyo. While average tenure at university is four years, Konishi Sensei remained at Keio University for eight years because of his love for kendo and jujitsu. He was Keio University’s kendo team captain, and continued coaching the university’s kendo club after his graduation. Konishi Sensei’s first exposure to “Te” (which later developed into karate) was through a fellow classmate at Keio University, Tsuneshige Arakaki of Okinawa. Konishi Sensei found the techniques of “Te” (as referred to by Arakaki) very similar to those of Takeuchi Ryu jujitsu. Though Arakaki was in no way a master of “Te”, Konishi Sensei found the system to be very intriguing. After graduating from the University, he became a salary man. However, he was not completely satisfied with his occupation. With encouragement from his wife, he quit his job and opened his own martial arts center in 1923 and called it the Ryobu-Kan (“The House of Martial Arts Excellence”), teaching mainly kendo and jujitsu. In September, 1924, Hironishi Ohtsuka, the founder of the Wado-Ryu style of karate, and Gichin Funakoshi, the founder of Shotokan karate, came to the kendo training hall at Keio University. They approached Konishi Sensei with a letter of introduction from Professor Kasuya of Keio University. Mr. Funakoshi asked if it would be possible to use the training hall to practice Ryukyu Kempo To-te jutsu. During this era, it was unheard of for one martial arts school to allow a martial arts teacher from another system to teach in their dojo. Such a request would be considered a “challenge” to the dojo. Konishi Sensei, however, was a visionary in the sense that he saw value in cross-training; he remembered the kata demonstrated during his university days by Arakaki, and he agreed to Funakoshi Sensei’s request. With Konishi Sensei’s help, Funakoshi established a To-te practice club at Keio University (the first university karate club in Japan). Konishi Sensei, Funakoshi Sensei, and Ohtsuka Sensei were the principal instructors. Konishi Sensei continued to instruct a curriculum consisting of kendo, jujitsu, and western boxing at the Ryobu-Kan. Karate-jutsu was born when Funakoshi Sensei added karate to this mix. As yet, no names were applied to the emerging styles. Groups that practiced a pure form of jujitsu did not think highly of karate, and challenged Funakoshi Sensei. However, under Japanese budo, one does not initially challenge the Master of a particular school or style; a challenge is first issued to the senior student. If the challenger defeats the senior student, then he can challenge the Master. If the challenger defeats the Master, he can take the dojo sign as a trophy – a very embarrassing situation for the defeated dojo, and one never experienced by Ryobu-Kan. All challengers of karate were defeated by Konishi Sensei and Ohtsuka Sensei, as Funakoshi’s senior students. After a challenge had been met, Funakoshi Sensei would explain karate-jutsu, and highlight the mental and spiritual benefits of the style. Many listeners understood and agreed to the point that they switched styles to study karate. During this time, there was an ongoing philosophical debate among martial artists as to the definition of budo. Some believed budo required the death of the opponent; others, that budo meant supporting or educating the opponent in the proper ways. Funakoshi Sensei always taught budo as technique and education. Konishi Sensei especially believed “Bu bun ryo do”, translated as “For karate to be perfect, it cannot be just technique, but also education.” As technique disciplines the body, education should discipline the mind. Thus Konishi Sensei believed that Budo involves educating the opponent. Over time, three major changes occurred in Funakoshi’s original karate teachings. First, because karate was introduced to the Japanese physical education program at the elementary school level, Funakoshi Sensei assigned Japanese names to replace the Okinawan names of the various kata, making karate easier to learn. The second change was the addition of ippon kumite to karate training. At first, karate training was primarilythe practice of kata. Konishi Sensei contended that training in kata alone was not sufficient to develop the whole person. Other forms of “Do”, such as kendo and Judo, had training methods that included application of techniques with partners. Konishi Sensei and Ohtsuka Sensei added ippon kumite to the training regimen. The third major change occurred in the kanji of “karate”. The original kanji used to write “karate” meant “Chinese hand”, indicating the source of the techniques. In 1929, teachers and students in the Keio University’s Karate Research Group discussed the translation of the kanji for karate, and agreed to change the kanji of “karate” to mean “Empty Hand”. They contend that this new kanji was a better representation of what karate had developed into. This change was adopted over the protests of many Okinawans, but remains the accepted translation to this day. Karate gradually became more popular and many masters from Okinawa began to visit Japan. Because of Konishi Sensei’s open-mindedness, many well-known budoka visited Ryobu-Kan during this era, exchanging techniques. Among them were: Kenwa Mabuni (founder of Shito-Ryu Karate), Chojun Miyagi (founder of Goju-Ryu Karate), and Choki Motobu. These three masters influenced Konishi Sensei in various ways and made definitive contributions to Konishi Sensei’s emerging style. Konishi Sensei considered Choki Motobu to be a martial arts genius and made every effort to train with him. Motobu Sensei’s specialty was the Naifanchin kata. As a teacher, he knew many kata, but would only teach them when his student had mastered Naifanchin. Through training in this kata he became famous for scooping his opponent’s leg. 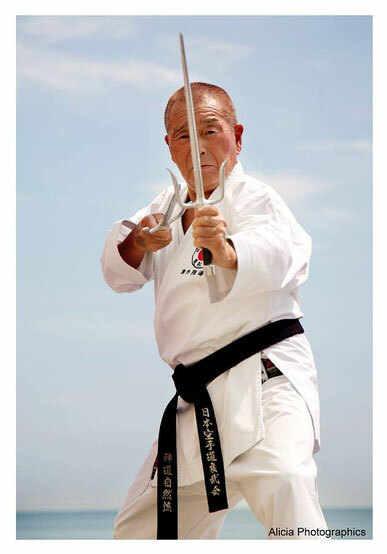 Although physically a big man, Mr. Motobu was very light on his feet, which may be the reason why he was so successful in challenging other martial artists to kumite. His teaching to Konishi Sensei emphasized footwork and the use of Ki. Motobu Sensei didn’t speak Japanese very well, and relied on friends to translate for him when he taught. He was not wealthy and had difficulty supporting himself during his visits to Japan. Konishi Sensei organized the Choki Motobu Support Society and arranged for seminars and training sessions at which Motobu Sensei was able to collect fees. Konishi Sensei accompanied Motobu Sensei to many training sessions in order to assist him in explaining the concepts and techniques of karate. Chojun Miyagi by all accounts did not talk very much. He was famous for his big hands and his teisho uchi (palm strike), and was noted for grabbing and pulling very strongly. Though Konishi Sensei did not train with Miyagi Sensei as much as with other karate masters, Miyagi Sensei did impact Konishi Sensei’s knowledge of karate by presenting Konishi Sensei with an original manuscript, An Outline of Karate-Do, dated March 23, 1934. This document has only recently been translated into English and is now available world-wide. Konishi Sensei trained extensively with Kenwa Mabuni, the founder of Shito-Ryu. Mabuni Sensei resided at Konishi Sensei’s house for about ten months from 1927-28. They became very close friends. Mabuni Sensei was celebrated for the wide number of kata which he knew and performed with great elegance and calm. Konishi Sensei developed the kata Seiryu in collaboration with Mabuni Sensei. Kenwa Mabuni’s influence in Shindo Jinen Ryu is evident in the kata syllabus of Ryobu-Kai. The Dai Nippon Butoku-Kai, the Japanese governing body for budo, was politically very strong; they set the standards for ranking individual martial artists and signed all certificates of membership. Konishi Sensei was already a member through kendo and jujitsu; he felt that karate would be effective in the education of the Japanese people, and so he applied to the Dai Nippon Butoku-Kai for recognition of karate. Through 1934, however, the government continued to award titles in jujitsu and judo, but not in karate. Finally, in 1935, the Dai Nippon Butoku-Kai recognized karate as a member and awarded kyoshi (“Master Instructor”) rankings to Konishi Sensei, Miyagi Sensei, and Ueshima Sannosuke (the founder of Kushin Ryu). The Dai Nippon Butoku-Kai also insisted that all budo have style names, and Konishi Sensei encouraged the prominent karate instructors of that time to name their individual styles. Because of his diligent efforts to advance karate in Japan, as well as his high level of skill in karate, Konishi Sensei was assigned in 1938 as the chairman of the screening committee of the Dai Nippon Butoku-Kai that reviewed all licensing applications in karate jutsu. Konishi believed that if you walk a morally correct path in this life, then you are naturally following the divine way. If you train in karate in a natural way and master your body, you will expand your knowledge and experience, and establish a solid foundation for naturally living a morally correct life. And so his style, on the recommendation of Morihei Ueshiba (the founder of Aikido), came to be Shindo Jinen-Ryu Karate-Jutsu (“godly, natural style, complete empty-handed way”). Miyagi Sensei named his style Goju-Ryu, as it blended hard and soft techniques. Mabuni Sensei studied under both Yasutsune Itosu and Kanryo Higashionna (Okinawan masters of To-te), and named his style Shito-Ryu, combining the first kanji from each of their names. For Hironishi Ohtsuka, the study of budo places one in harmony (“wa”) with the universe; his style became known as Wado-Ryu. Ueshima Sensei based Kushin-Ryu (“Sky-Heart”) on the idea of the universe and person as center and in harmony. And students convinced Funakoshi Sensei to name his style Shotokan: Shoto, meaning “Pine Waves”, was Funakoshi’s pen name. Konishi Sensei and his wife also studied under Morihei Ueshiba, who was still teaching Daito Ryu Aikijujitsu at that time. Konishi Sensei considered Ueshiba Sensei to be the best martial artist he had ever known. Konishi Sensei carried this opinion throughout his lifetime. Having already trained in karate for a number of years, Konishi Sensei demonstrated the kata Heian Nidan (which he learned from Funakoshi Sensei) to Ueshiba Sensei. However, Ueshiba Sensei remarked that Konishi Sensei should drop such nonsense for such techniques are ineffective. This comment came as a blow, since Konishi Sensei believed in karate and that held Ueshiba Sensei’s opinions in the highest regard. Konishi Sensei felt that karate still had much value and that he had the responsibility to develop it. Thus, he requested that he be allowed to continue training in karate, intending to develop the techniques so that it would be acceptable to the great teacher. After many months of research and training, Konishi Sensei developed a kata called Tai Sabaki (Body Movement). He based this kata on karate, but incorporated principles found in the teachings of Ueshiba Sensei. Though the new kata did not contain any complex movements, it consisted of a chain of actions, with no pause after each action. After the demonstration of this kata by Konishi Sensei, Ueshiba Sensei remarked that, “The demonstration you did just now was satisfactory to me, and that kata is worth mastering.” Later, Konishi Sensei developed two other kata based on the principles of Tai Sabaki. The three kata became known as Tai Sabaki Shodan, Tai Sabaki Nidan, and Tai Sabaki Sandan.